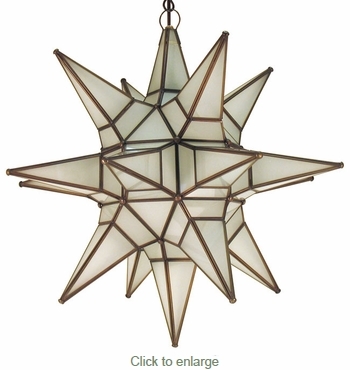 This 18-point frosted glass Moravian style star light is a beautiful way to illuminate any room in your home. This hanging star lamp with frosted glass panels was handcrafted by talented artisans in Mexico who adopted this Moravian tradition. These star light chandeliers complement any rustic decor and add a celestial feel to any room. Since each rustic star fixture is hand crafted, color and finish may vary slightly from what's pictured here. Chain and ceiling plates sold separately.